^ Hammarström, Harald; Forkel, Robert; Haspelmath, Martin; Bank, Sebastian (编). 潮州话. Glottolog 2.7. Jena: Max Planck Institute for the Science of Human History. 2016. ^ 9.0 9.1 9.2 Dylan W.H. Sung. 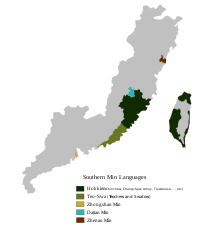 Min - Chaozhou Dialect. 2003年1月28日 [2007年2月4日]. （原始内容存档于2010年1月11日） （英语）. ^ "Teochew · Mogher - 潮州音字典" 存档副本. [2016-06-19]. （原始内容存档于2016-03-08）. .